How Do I Get Photos Off My Red iPhone? iPhone X has an amazing camera that is capable of capturing stunning photos and recording high quality videos (HEVC). However, the recorded videos take a lot of space and there may come a time when you will need to delete some of the videos to free up the space. There are several ways to do this. You can easily delete videos by using Photos app on your iPhone X. The videos you shoot are saved in Camera Roll, so you will need to use that app in order to delete your recorded videos. Step 1: Open ‘Photos’ app on your iPhone X and tap on ‘Albums’. There you will find ‘Videos’ section. Step 2: Use the ‘Select’ option located at the top right corner of the screen and choose the videos you wish to delete. After selection, use the ‘Trash’ icon located at bottom right corner to proceed. Step 3: Once you select ‘Trash’ icon, a pop-up dialog will appear. 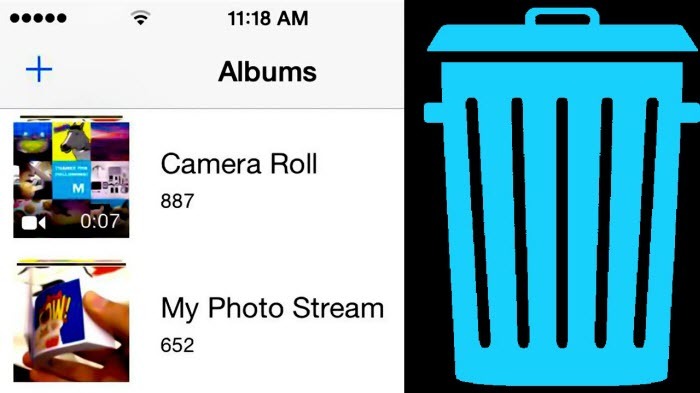 Select ‘Delete Video’ option and your videos from iPhone Camera Roll will start deleting. There is another way to delete videos from your iPhone X if you don’t want to use Photos app. You can do this via iPhone Settings. This process is easy. Step 1: Open iPhone Settings and go to Manage Storage option available in General>Usage section. There, choose Videos option to proceed. Step 2: Once you are in Videos section in the Setting app, you can choose videos you wish to delete. Step 3: After selection, swipe from right to left and select Delete option. Your video deletion process will start. Apart from using Photos and Settings apps, you can also delete your videos using Videos app on your iPhone X. Step 1: Open Videos app on your iPhone X and select Movies/TV Shows category. Step 2: Now tap Edit option available at the upper right corner. Once you select Edit option, an X icon will appear at the upper left corner of your videos. Tap the X. Step 3: Now select the videos you wish to delete and then swipe from right to left in order to proceed. You will see a Delete button. Use it delete your selected videos. While the above mentioned methods allow you to delete videos from your iPhone X, they are not recommended because those methods do not erase videos permanently, which means they can be recovered using a recovery software. As everyone know how much their privacy means to themselves, no one want their private videos recovered and viewed by someone else. Fortunately, there’s a way to delete videos permanently; with the use of iMyFone Umate Pro software. It is a complete one-click solution to clean up your storage and free up space conveniently. Data deleted by iMyFone Umate Pro is permanent and 100% unrecoverable. Delete your private data separately. This is a great feature if you don’t want to perform a full cleanup and only want to delete selected files individually. You can also preview files before deletion. 1-Click Free Up space feature to quickly and conveniently clean junk files. Delete several types of files including apps, junk files, temporary files, etc. Step 1: First, download and install iMyFone Umate Pro on your computer if you haven’t done it already. And then connect your iPhone X to your computer, it will be automatically detected by the software. 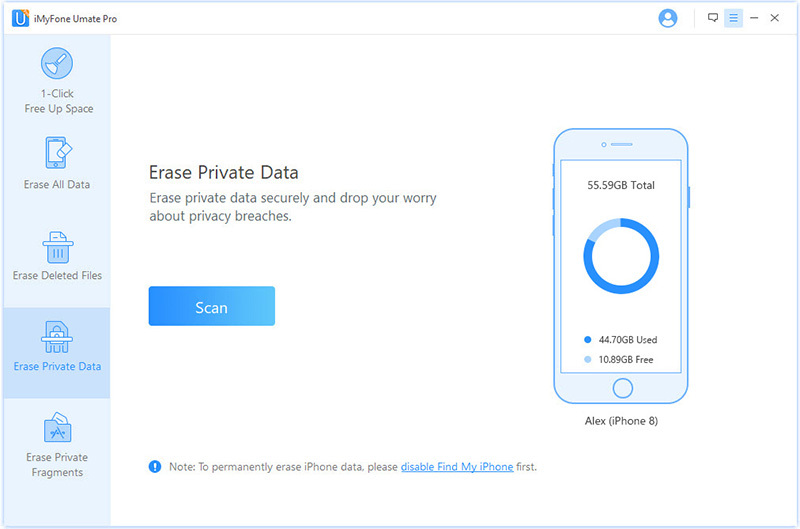 Step 2: Use the Erase Private Data option to start scanning. Step 3: Once the scanning process is completed, you will see a list of files available for deletion. Step 4: Now choose Photos and Videos section. Select video files you wish to delete and click on Erase Now button. The process will start and your video files will be permanently deleted. 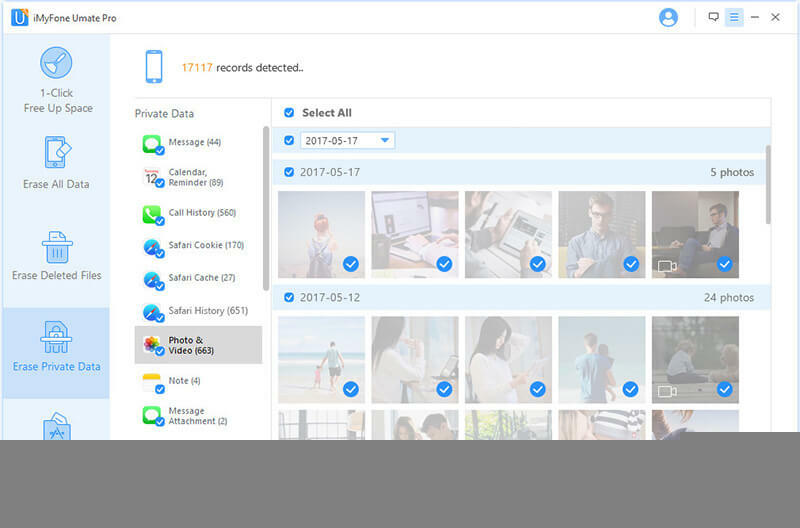 You can see how fast and convenient iMyFone Umate Pro is as compared to other methods when it comes to data deletion. You can use it as your daily iPhone X cleaner tool.